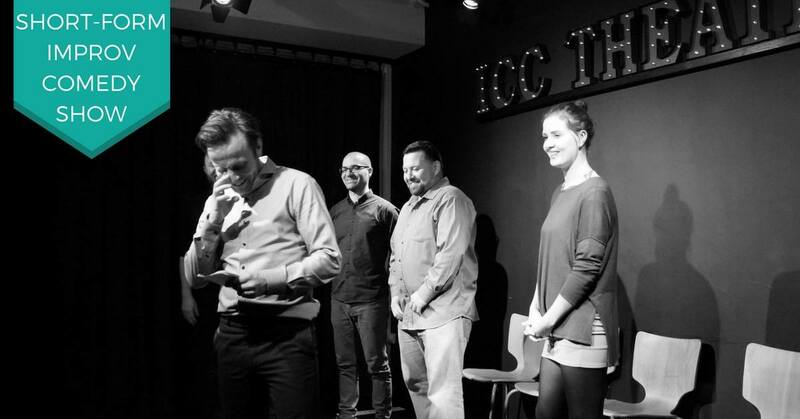 Short-form Thursday – or ‘Whose Show Is It Anyway?’ – is Improv Comedy Copenhagen’s weekly improvised show filled with sketches and games all inspired by suggestions from the audience, and performed by the hilarious ICC Touring Company. The Short-Form Show is the ICC’s signature form enjoyed at company events, private parties or anywhere they’re on tour. If you like “Whose Line Is It Anyway?” then you will love our Short-form Thursday! It’s an evening of improvised games where the audience puts the ICC performers on the spot to be funny with whatever suggestions they are thrown at them. Come put your mark on a fun, uncensored and spontaneous night! What is Short-form Improv Comedy? Improv is the skill of creating characters and scenes without having a script, rehearsal or even knowing what you are going to be doing before the show starts. Short-form Improv comedy is doing all that just to make your audience have a truly enjoyable night out. When performing as the member of an improv team, you are an actor, musician, director, member of the chorus, scriptwriter, straightman, clown, and prompter, all improvising the entire story line moment to moment. There are no props or set – just the improvisers and the audience’s imagination.